Join us for a cycle trip that explores the classic highlights of South East Asia in an active way. Travel by bike, bus and boat to discover cultural diversity, natural beauty and fascinating history. Along the way we visit Khao Yai National Park, Angkor, the Killing Fields and silk weaving villages on the Mekong Delta. Arrive Bangkok and check-in to the hotel. The rest of the day is free. You may choose to take an optional cruise along the city's Klongs (canals) in a traditional longtail boat - an ideal way to explore Bangkok's network of backwaters that branch off from the Chao Phraya River. The excursion will also include visits to Wat Arun, the Royal Barge Museum and the Temple of the Dawn, built to represent the towering slopes of Mount Meru - the Khmer's mythical home of the Gods. From busy downtown Bangkok we take a short hop across the Chao Praya River to an extraordinary place known to locals as Bang Kra Jao. Crossing the river is like taking a journey back in time where we find a peaceful place with a maze of waterways, small villages, temples and real tropical jungle. If it wasn't for Bangkok's skyline, you would never believe you were so close to the city and there is no traffic! We ride through the local communities, temples and schools stopping for a snack at a river pier across from Thailand's naval academy. Next we visit a fascinating temple, built in the Ayutthaya period more than 250 years ago with a unique teak wood roof, windows and shutters painted in the ancient Mon style. We cycle on to the relaxing Sri Narkon Park and enjoy lunch at a local restaurant before returning to the hotel for some downtime. Later this afternoon we see another side to Bangkok on our night ride, visiting a night market, the flower market and stopping for dinner along the way. This morning we drive for about 1.5 hours to Nakornnayok Province, where we spend the rest of the day cycling in Khoa Yai National Park. On our ride we will take in the impressive sight of Thailand's largest dam, Khun Dan Prakan Chon Dam, where we can enjoy panoramic views from the top. We then cycle to Heaw Narok waterfall with three cascades and cool mountain waters that provide a refreshing swim break from the tropical heat depending on the season. At the base of the falls are a few rustic restaurants where you can get some great authentic Thai food and a cool beer. We recommend you try the somtam (spicy papaya salad) with grilled chicken and sticky rice. We then have a short drive to our hotel for the night. After breakfast we drive for about two hours toward Aranyaprathet. We break up today's bus journey with short morning and afternoon rides past typical scenes of rural Thailand. We will cycle through villages and enjoy the relaxed pace of life in the countryside. Rong Kluea Market also known as Ban Khlong Luek Border Market, it is said to be one of Thailand's most frequented border markets. Once we have finished exploring the market we take a short drive to our hotel in Aranyaprathet and freshen up before dinner. This morning we drive just 15 minutes to Poipet International border. After completing the Cambodia visa formalities we say farewell to our Thai support team and bikes and meet our hosts for the rest of the trip. The drive will take us about 4 hours to get to Siem Reap, the gateway town for the incredible Khmer temples of Angkor. On the way, we will stop to visit the silk farm at Pourk to see the process of silk making from start to finish. On arrival in Siem Reap, we will check into our hotel and have time to visit the temple of Bayon and the South Gate of Angkor Thom by bus for sunset. This evening is free for you to explore the town and its restaurants. Today we drive a short distance to Angkor Wat to collect our bikes which we will use for the rest of our trip, then set off to discover several of the ancient temple cities by bike. We cycle to the impressive Ta Prohm Temple, which remains in the clutches of the encroaching jungle. Here we spend time visiting the temple, before pedalling along small hidden trails to the ruins at Phimeanakas, the Elephant Terraces, the Bayon, Baphoun and Preah Khan. In the afternoon we visit magnificent Angkor Wat with its extraordinary architecture and bas-reliefs. At the end of the day we cycle back to our hotel. Our total cycling distance today is approximately 25 kilometres. 80% of todays riding is off road but not technical. Today we will leave the crowds behind on a cycle ride to the small village of Rolous where we visit the temples, before continuing to a local market. After a rest and time to explore the stalls we take a boat to the floating village of Kompong Phluk. Our ride through rural Cambodia offers plenty of opportunities to once more connect with local people. The fascinating village of Kompong Phluk is built on stilts in Tonle Sap Lake. Its residents live a communal lifestyle and you will see everything from floating pig pens to young children paddling around in what looks like a bowl selling souvenirs and singing songs. After our boat trip we enjoy a home hosted lunch where we can ask questions and learn about local cuisine as well as everyday life. The the afternoon we take to our bus to visit Banteay Srey, where we collect our bikes again and cycle 25 kilometres to either East Mebon to enjoy watching the sunset, before either cycling or driving back to Siem Reap. Today we leave the temples of Angkor behind and drive south to Phnom Penh. It's a longer day in the bus today with about six to seven hours driving. On the way as well as comfort stops, we'll stop at the famous ancient bridge at Kompong Kdei. We continue on to the capital, then leave the highway and from drive to Koh Dach ferry dock. From the dock, we take an excursion by local ferry along the Mekong River to Koh Dach Island where we visit a traditional Khmer weaving village. There are many handicrafts that come from this sleepy island but they are best known for the silk weaving. You will see how the villagers produce their own dyes and weave silk on old looms. Discover and learn about the traditional way of life as you cycle for about 22 km around the island. We return to our bus by the same ferry before driving the short distance on to busy Phnom Penh. Phnom Penh is a lively city with many French colonial buildings and plenty to see. Angkor was Cambodia's capital city until the 1440s when it switched to Phnom Penh. Today we explore the emotive Tuol Sleng Genocide Museum, formerly a high school that became the Khmer Rouge's main torture and interrogation centre; the National Museum, a treasure trove of beautifully preserved carvings and lintels rescued from Angkor; the Royal Palace and Silver Pagoda, all with a local guide. We then drive out of the city to the infamous Killing fields of Choeung Ek - the memorial stypa is a glass tower filled with human skulls - a gruesome reminder of the scale of Pol Pot's atrocities. After breakfast, we drive for about three hours directly to Prek Chak and cross the border. Once we have completed the Vietnamese visa formalities we continue the short distance by bus to Ha Tien town. Getting on the bikes we spend the afternoon cycling around this charming, colourful town alive with vibrant riverside markets. Dramatic limestone formations are scattered around and, with its location sitting right on the Gulf of Thailand, this is a truly scenic spot to spend the night. We drive for about 30 km from Ha Tien town before starting today's ride. 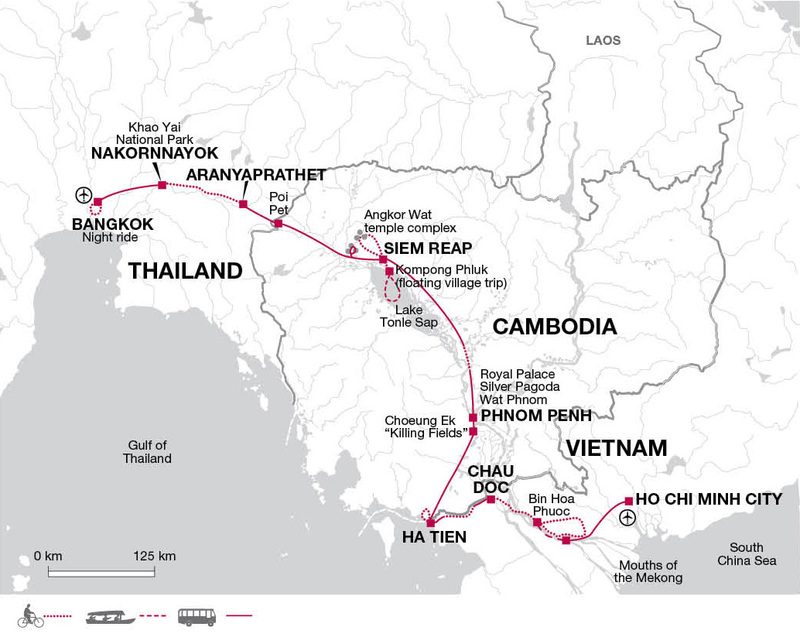 The journey takes us on flat terrain along the Vinh te Canal which once marked the border between Vietnam and Cambodia. At Tri Ton via Ba Chuc we see the Bone Pagoda, another ghastly reminder of the Khmer Rouge regime. We explore the emerald green wetlands of Tra Su Cajeput forest with its many water hyacinths and water lilies. Our ride ends at Chau Doc, a lovely little town on the banks of the Hau Giang River where we will spend the night. This morning we drive from Chau Doc to Long Xuyen, which should take us less than a couple of hours. After catching the ferry we get back on the bikes for a ride to Dinh Yen village where sedge mattresses are weaved from seagrass. Continue cycling through Lai Vung and Tan Quy; districts famous for their mandarin oranges. The final short section of todays journey is by bus before arriving at our homestay for the night in Binh Hoa Phuoc. We stay in a traditional house that is equipped for tourism and the owners live next door. Rooms are simple and clean with fans, mosquito nets and ensuite bathrooms. There is a living room, as well as indoor and outdoor dining options. Dinner is included and will consist of local dishes made from fresh locally sourced ingredients, a great opportunity to try traditional dishes and learn more about Vietnamese cuisine and cooking methods. We enjoy our last ride today with a cycle around the beautiful island of Binh Hoa Phuoc. The island is littered with tropical fruit orchards and as well as admiring the colour and variety of fruits we will also stop to sample produce along the way. We take leave from the bikes and travel by boat to Cai Be. Back on land we drive the final leg to Ho Chi Minh City, Vietnam's largest city and most vibrant. When cycling: bring quick drying cycle tops, padded cycle shorts, plus a lightweight wind and water proof jacket. From December through to February warmer clothing is needed for the North and the highlands. Days are hot and humid. Comfortable walking shoes or sandals, trainers or flip flops are useful when not on the bike. Although entirely voluntary, tipping is a recognized part of life in this region of the world. Some local staff will look to members of the group for personal recognition of particular services provided. In order to make things easier for you, the Explore Leaders may organise a group's tips kitty and if this is the case, they will account for it throughout the trip. Accordingly you should allow approximately USD 60 for gratuities for local staff. 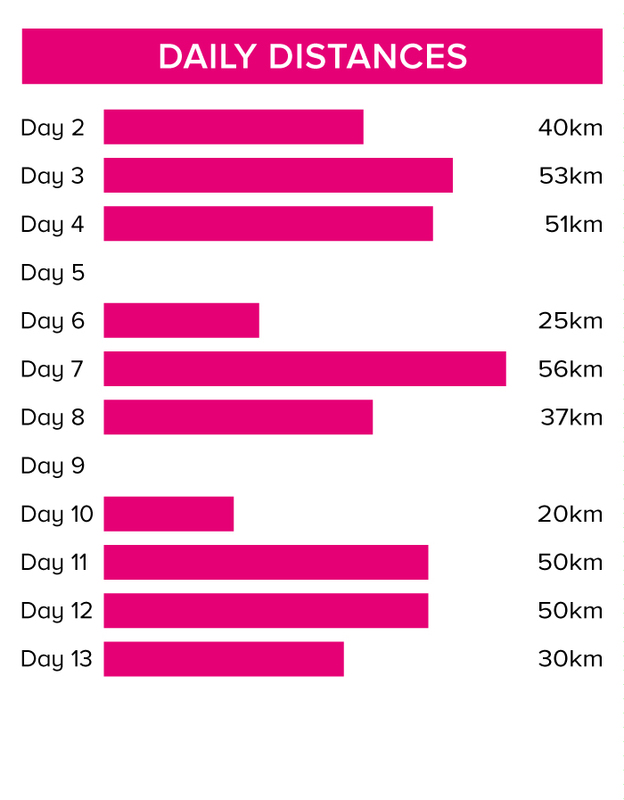 On this trip we cycle 412 km over ten days (an average of 41 km per day). We travel mainly on quiet backroads, on flat terrain with occasional inclines. A support vehicle accompanies the rides throughout the trip. We have graded the route as moderate. Your included bike in Thailand, Vietnam and Cambodia is a 24 gear Giant or ATX mountain bike with front suspension and will be the correct frame size for your height. A handlebar bag or pannier and water bottle holder are included as well as the facility to fit your own pedals or saddle if you wish to bring them. A support vehicle accompanies the rides throughout the trip. We provide spare parts and take care of the day to day maintenance. All you need to bring is your own helmet.